For many John Jay students, understanding the impact of September 11th is an educational journey, not a memory. 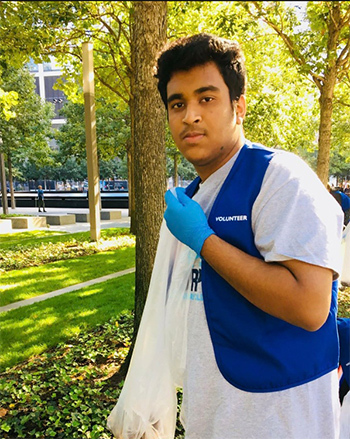 Sutoy Sufian, an APPLE Corps student who volunteered at the September 11th Memorial and Museum for five weeks, had the opportunity to deepened his knowledge about the event, while interacting with visitors. We chatted with Sufian to learn more about his journey. Before volunteering at the memorial and museum, what were your thoughts and feelings about September 11th? Although I was aware of what happened on September 11th, I wasn’t fully educated about it until high school. Being born and raised in a different country, I wasn’t taught about 9/11 in a detailed manner. Then my family immigrated to the United States in 2011. As an immigrant who just began learning to speak English in middle school, I was shocked and frightened each time I gained more knowledge about this tragic day. When you first walked through the September 11th Memorial and Museum, how did the sights and exhibits affect you? Walking through the memorial and museum for the first time, I realized that it wasn’t a typical museum. People visit it to remember and honor the loved ones they lost from the attack. Visitors don’t seem cheerful. Some people can barely hold back their tears as they look around at the debris of World Trade Center and the beautiful pictures of the Twin Towers. I realized my job was to interact and assist these visitors. I was scared, yet grateful, to help them pay respect to the innocent lives that were lost. What was your best memory from helping the visitors? My favorite story would have to be when I asked a visitor about his favorite memory at the Twin Towers. He revealed that he proposed to his wife on top of one of the buildings. He also had dinner with her in one of finest restaurants in the building on their anniversary. What would you want people to know about the memorial and museum? I would recommend it to anyone who is interested in learning more about the day. The museum allows its visitors to gain knowledge through its contents. There are multiple pictures with informative captions and debris from the building, giving visitors an unforgettable experience and crucial knowledge. How do you connect your experience as a student John Jay to September 11th? During my internship, I learned that many John Jay alumni lost their lives due to the attack on September 11th. I often think about those men and women, and I wonder what their lives would be like if they weren’t taken away from us. They would have had such a positive effect on our society. I’m majoring in Economics, and although I’m not studying information that would give me the expertise to stop a terrorist attack, I truly respect my John Jay peers who are studying Criminal Justice, Forensic Psychology, Cybersecurity, Security Management, and other subjects that could prevent any other tragedies from occurring.